This 27 year-old woman with AIDS was referred by the medical department because of a 6-month history of a slowly enlarging left nasal limbal lesion (Figure 1 and 2). The lesion was non-tender and her vision in both eyes were normal. 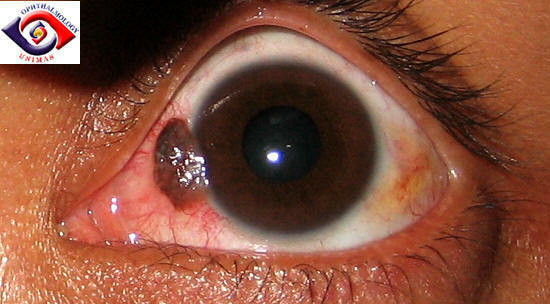 Slit-lamp showed the lesion was confined to the conjunctiva without deep tissue invasion. Fundoscopy showed no signs of cytomegaloviral retinitis. She had no skin lesions. The first attending ophthalmologist diagnosed Kaposi's sarcoma and started the patient on topical mitomycin C.
Figure 1. Left pigmented nasal limbal lesion. Figure 2. CLose-up view of the lesion. a. Do you agree with the diagnosis? c. What is the most likely diagnosis?